Many of you may already be familiar with developer Dean J Robinson. He already has several popular devlopment projects under his belt. He’s written the Fluency Admin theme which is a replacement for the current WordPress Admin theme. He also wrote Hahlo which is one of the top Twitter clients available for the iPhone. You can find all his currently available projects on this page. 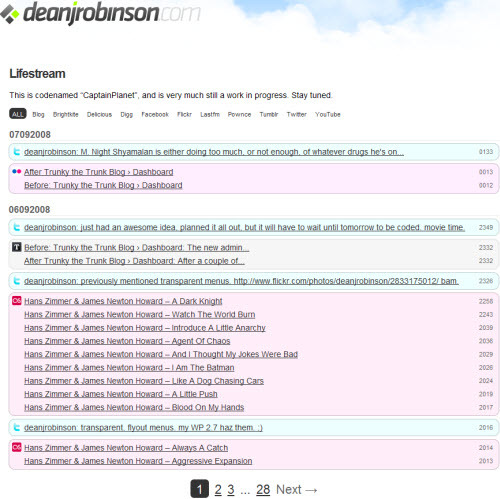 Well apparently Dean is a fan of Lifestreaming because he’s currently developing a new Lifestreaming Plugin for WordPress. Around March of this year, he tried using several Lifestreaming plugins and determined none of them operated quite how he wanted so he decided to write his own. CaptainPlanet is basically a ‘lifestream’ manager for your WordPress blog. Plans are to support a number of popular feeds, which are aggregated (and archived…) for display on you site. Will have an awesome ‘manage’ screen (one of the few bits thats actually working correctly at the moment), and also makes use of the new ‘shortcode’ API in WP2.5. Will also have several built in function that will do away with the need for some of the JS callbacks I currently use for things like Twitter and Flickr. The return of Captain Planet, bigger and better. Ok so the super rushed dev of the first iteration didn’t go so well. This one should be better with a bit of luck. In the backend its more flexible, allowing you to add whatever feeds you want, its working wonderfully with any feed from Feedburner, but I’m yet to give it a real workout with raw feeds directly from flickr/delicious/twitter etc, but I see no reason why it shouldn’t continue to work. I’ve already had a couple of request from people who’d like to test it, which is great, and once I’ve gotten to a point what I’m happy for that to happen I let them in on the fun. And here we are now in September and still no Plugin. This seems like a project worthy of anticipation. I really hope that he’s close to releasing it as this could be a very nice addition to the existing library of Lifestreaming plugins available for WordPress. Thanks for the write-up, nice to see people interested in what I'm doing. Captain Planet is still a work in progress, I haven't done anything on it for a couple of weeks mainly because I wanted to get it setup on my site, and let it run wild for a couple of weeks to see how it behaved. So far, its been fine, a few small issue with feeds not updating when I expected them to but other than that its been fine. I've still got a lot of mess and unused code floating around which I need to sort out, plus a few features I still want to add in, but its getting close to the point where I'll put out a call for some beta testers to help test it out with their own selection of feeds. Thanks for coming by and giving us an update Dean. Keep us posted on when you're ready to unleash it. I'm sure my readers will be very eager and best qualified to help you test it out.